You can realistically advertise on Facebook or any other marketing platform (like Google Adwords, Twitter etc) for FREE as long as you focus on optimising this one metric called ‘Return on Ad Spend’ (ROAS). You just need to keep your ROAS to 2 or above. Higher the better. As long as you do that you can continue to advertise on any marketing platform for FREE and still make money on top of that. Let me show you, how that is possible. Let us also suppose your sales from Facebook ads was $400. 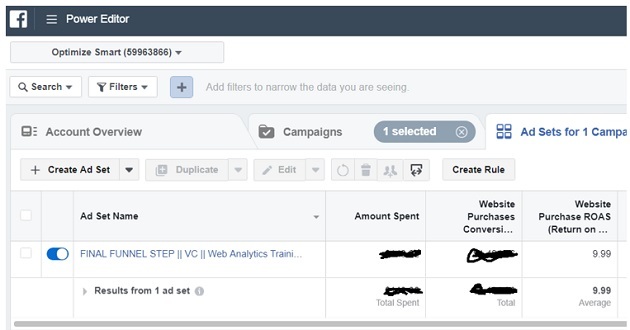 The money that you spent on Facebook advertising was $200. You did not pay this money from your own pocket. You paid this money from the sales you generated via Facebook ads. So basically you were paid by Facebook for advertising on their platform. This is the amount of money which you could not have earned without Facebook ads. It is very important to remember that Facebook does not owe you any money. So if you stop advertising on Facebook tomorrow, this money will disappear into thin air. This is the kind of money you can generate only from Facebook. And this is just when your ROAS is 2. If your ROAS is say 4, you can make $4 for every $1 you spend on Facebook. And trust me ROAS of 4 is very realistic. Even ROAS of 6 or 8 is quite realistic. Here the ROAS is 6.69 i.e. for every dollar I spend on Facebook, i get 6.69 dollars in return. So basically I advertise on Facebook for FREE. In fact Facebook pay me for advertising on their platform. I sell my web analytics training courses through facebook which cost US $498. So I am not selling $10-$20 items here which are much easier to sell on Facebook. I am selling high ticket items. And I do not really have any big budget either. My daily ad spend is around $20. But I have managed to consistently sell very high priced items which many will tell you is not possible. I do not have tens of thousands or millions of followers on Facebook either. But my ads are reaching to the right people, my core target audience. That’s the difference. That’s why I don’t need lot of reach to generate sales. Majority of retailers sell items on Facebook below $50 and they mostly target random people. Because of that they need to target a very large audience which increase ad spend and decrease ROAS. Having said that my results are not typical and I am not promising that you will also get the exact same level of results. What I can promise you is that getting 100% ROI is not a far-fetched dream. It is very realistic. You have to be in some very boring niche, to not to be able to make any money from Facebook. There are lot of marketers out there making insane amount of money through Facebook ads. And you will be able to see through your reports whether or not you are profitable. So you don’t have to rely on guess work. Just track purchases within Facebook. But here is the thing. You need a ROAS of 2 or above for this magic to happen for you. Many marketer do not get the ROAS of 2 or above because their focus lies elsewhere. They seem to be more interested in optimizing for clicks, impressions, cost per clicks, cost per thousand impressions, CTR etc. Now nothing really is wrong with these metrics. They are all good for optimization. But in the grand scheme of things, they don’t really matter. What really matter is your ROAS. At the end of the day if you are no making money, if you are not profitable, even a CTR of 100% doesn’t mean anything. If you focus on increasing your ROAS, you can practically run your ad campaigns with unlimited marketing budget for FREE and continue to make money on top of that. It is like using Facebook as a cash generating machine. You put $1 into Facebook and you get $2 or more back. The more dollars you put in, the more dollars you can get back. However there is one caveat here. Don’t get carried away. Don’t get your hopes so high. If you put $1 million dollar into Facebook advertising system, you won’t magically get $2 million or more in return. The law of diminishing returns will stop you from doubling/tripling your ROAS by just doubling/tripling your marketing budget. You can’t just double your ROAS by doubling your ad spend. According to the law of diminishing returns, if you keep adding more of one unit of production to a productive process while keeping all other units constant, you will at some point start producing lower per unit returns. So in order to increase your ROAS, you need to do lot more than just doubling your marketing budget. 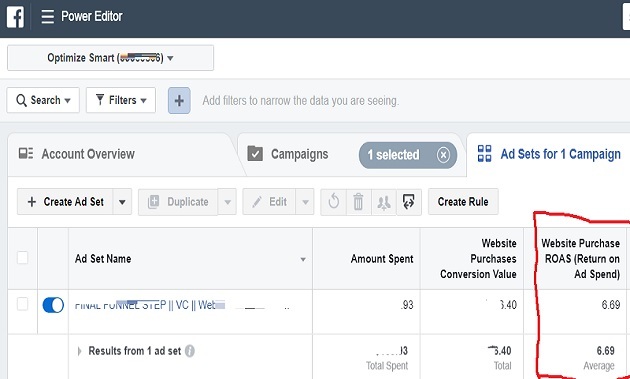 You need to continue to optimize your ad campaigns for conversions. You would need to run new tests. Target new markets etc. But this is all possible only when you first shift your focus from clicks & impressions to ROAS.